WASHINGTON — Both American and Canadian officials said they’re optimistic about continued strong cooperation between their nations’ space programs despite trade and other disputes. 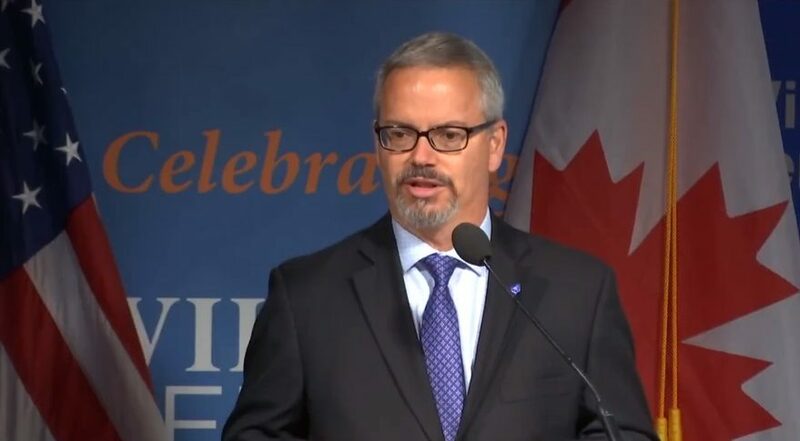 Speaking at a Sept. 7 forum at the Wilson Center here about U.S.-Canada space relations, Scott Pace, executive secretary of the National Space Council, praised the long history of cooperation between the two countries in space activities and expected it to continue. “We now find ourselves on the cusp of a very new era across all these areas and a promising future, and our bilateral partnership with Canada has been a strong asset in the past and is going to continue to be so in the future,” he said. He spoke while, just a few blocks away at the offices of the United States Trade Representative, American and Canadian negotiators were discussing issues related to changes to the North American Free Trade Agreement. Those came after months of trade disputes between the countries. Pace’s comments came after NASA Administrator Jim Bridenstine and Canadian Space Agency President Sylvain Laporte, in keynotes at the event earlier in the day, praised the cooperation between the two agencies and said they expected it to continue. Bridenstine noted that he and Laporte discussed potential Canadian cooperation in the NASA-led Lunar Orbital Platform-Gateway. “We need to take advantage of some of the great capabilities that Canada has developed,” he said, such as a version of the Canadarm2 robotic arm on the International Space Station that could, for the Gateway, be used to help maintain it when astronauts are not on board.